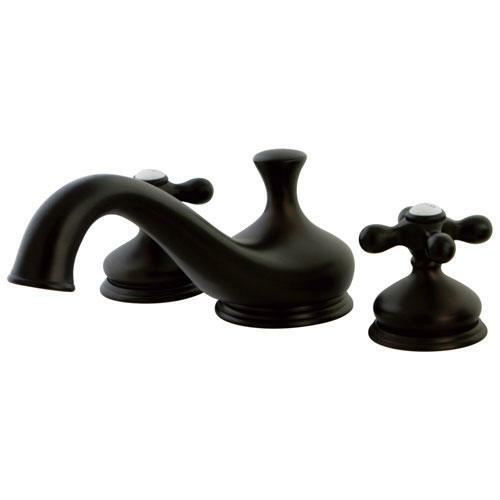 Kingston Oil Rubbed Bronze Heritage Two Handle Roman Tub Filler Faucet KS3335AX: This Two Handle Roman Tub Filler Faucet is built to last. The highest quality standards are used to precision manufacturer a top of the line product. Important features of this BRAND NEW Fixture: Complete Item! Everything necessary for installation is included. - Solid Metal Cross Handle - Matching Accessories Available - Easy to Install - Installation instructions included - Two Handle Roman Tub Filler Faucet - Solid brass construction for durability and reliability, Premium color finish resists tarnishing and corrosion, 13.0 GPM at 60 PSI, 8 1/2-inch spout reach, 4 1/2-inch spout height, 2 1/2-inch spout clearance, 3/4-inchIPS Inlets, 1/4 turn ceramic disc cartridge, 8-inch-36-inch widespread installation, Ten year limited warranty. - Drip-free ceramic cartridge - 3-hole installation - 8-inch to 36-inch spread - 3/4-inch IPS - All mounting hardware included - Required Rough-in Valve Included! - Oil Rubbed Bronze premier finish designed to resist fading and tarnishing. This fixture is manufactured by Kingston Brass and is part of their Heritage collection. Solid brass construction for durability and reliability, Premium color finish resists tarnishing and corrosion, 13.0 GPM at 60 PSI, 8 1/2" spout reach, 4 1/2" spout height, 2 1/2" spout clearance, 3/4"IPS Inlets, 1/4 turn ceramic disc cartridge, 8"-36" widespread installation, Ten year limited warranty.